It is very difficult to get rye bread over here. Today I baked a loaf of rye and a loaf of wheat bread. I've been experimenting with sourdough rye before; so far the results have not been satisfactory. I have no such problems with wheat bread. The only thing that needs improving is the shape of the loaf, they've been very flat so far. 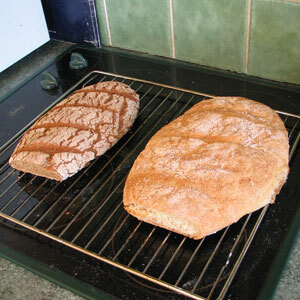 Rye bread on the left and wheat on the right. I've grown tired of the tan design so I decided to go back to the old one. P.S. I forgot to take the photo of the breads before I test-tasted them.